Anyone with a computer or even a smart phone can write pretty much anything and stick it up on the internet these days, and a lot of that ‘anything’ seems to pass as factual or newsworthy. Don’t get me wrong, I’m all for more information and analysis but just because you or I have a blog or a web venue does not a journalist make. Schlock internet reporting doesn’t bother me much when it’s dealing with, say, politics or religion but when it comes to the Chicago Cubs – I have to draw the line! Which brings me to what pissed me off yesterday two articles about Hohokam Stadium and Cubs spring training on yahoo sports (I know, hardly a bastion of journalistic integrity), but these two ‘articles’ were riddled with misinformation. As I mentioned, error-filled, internet pseudo journalism doesn’t normally bother me, in fact it occasionally amuses me. And I don’t want to come down hard on the writers in this case because apparently both are Cubs fans. Really it’s the Yahoo Contributor Network that is at the root of the problem. There is a bigger issue as well, these freaking big brother email reading software bots that flesh out key words in our emails. Yes, our emails, (if you use Yahoo or Google), hell I think most large free email systems have them. I’m getting off track, but it’s because of these email reading big brother bots that I’m automatically fed any Cubs related ‘articles’ (and I use the word ‘articles’ loosely in this case) to the front and center of my screen when I’m using email. These two Cubs fan contributors likely had good intentions in passing along a little Cubs spring training knowledge to fellow fans. The problem is, apparently there is no editorial oversight for the Yahoo Contributor Network, so they toss these pieces up on the web without giving them a glance. 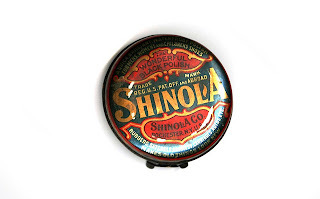 Sure, one fan passing on info to other fans is a kind gesture and all, but what if one fan doesn’t know as my grandmother used to say – sh*t from Shinola. Shinola apparently was a type of shoe polish sold in the U.S. until sometime around the 1950’s. Now I am certainly not the editorial judge of things but I do know a little about Cubs spring training and I did go to the Arizona State University Walter Cronkite School of Journalism. Bear in mind I did sacrifice some class work to help ASU earn its prestigious honor as the nation’s #1 party school. For me real journalism’s demise began when the F.C.C. dismantled the Fairness Doctrine, by the time Hunter S. Thompson blew his brains out at the “Owl Farm” journalism had fragmented into word particles landing on a billion different IP’s. But I digress. So as a service to all Cubs fans I’ve got to set the facts straight on these two Yahoo Contributor Network ‘articles’ floating around the interwebs. Matthew Smith starts his article Spring Training 2012: Hotels in Mesa, Arizona by saying ticket prices at Cubs home games at Hohokam “range from $5 to $15”. I’m not sure where Matthew has been but ticket prices haven’t been that low in years. Currently the range for Cubs home games at Hohokam is $8 to $31, you can find more info on pricing, game schedule, and a great seating chart on the BOS website here. I’m sure the rest of Matthew’s article gave some great hotel information but given the shaky beginning he may have you looking for the $19 dollar room at the Maricopa Inn which was demolished years ago. Given the title of the other article written by Luna Hanie, Fan’s Guide: Cubs Spring Training at Hohokam Stadium, it’s a bit more off-putting to see errors. From its first sentence “Hohokam Stadium has been the spring training home for the Chicago Cubs since 1952”, we are misinformed. 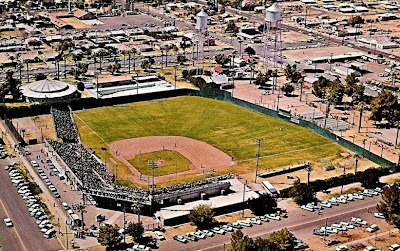 Rendezvous Park in Mesa was the first Cubs spring home in 1952, training there until 1965. In 1966 the Cubs trained in Long Beach, California followed by a move to Scottsdale, AZ from 1967 to 1978. In 1979 the Cubs moved into Hohokam Park (not the current Hohokam Stadium) and played there through the spring of 1996. At which point old Hohokam Park was demolished and the current stadium built on the same site in time to open for the spring of 1997. Got it? There will be a quiz! 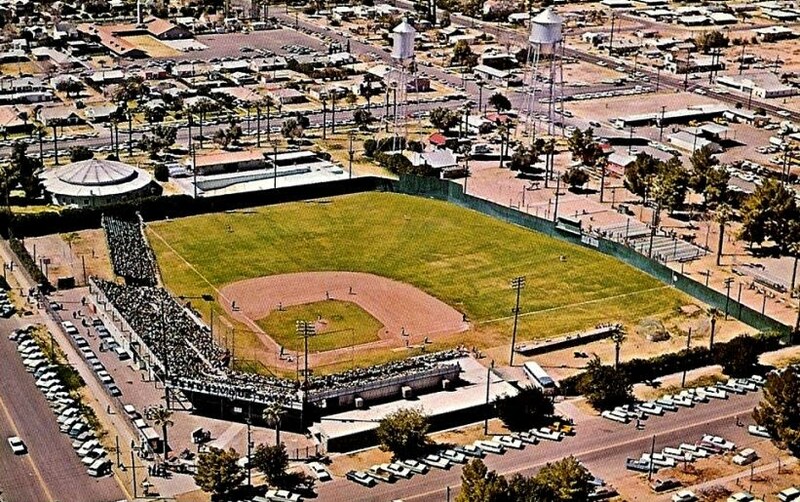 Later in the article, under the heading Amenities it says, “In 1997, Hohokam Stadium underwent renovations that provided the stadium with modern facilities”. As I already mentioned the earlier Hohokam ballpark was not “renovated” in 1997, it was completely demolished to barren dirt and a brand new Hohokam built on the same grounds. I’m not trying to get on anyone’s case but I do feel Cubs fans deserve accurate information, as it seems information is the life’s blood of the new Cubs management regime. To that end, the Boys of Spring website is undergoing some changes and updating some out of date info. This would have been done sooner but we had to change our website design team unexpectedly. As usual if you can’t make it to AZ, Boys of Spring will be the place to go for Cubs news, photos, and videos during spring training. Heck, even if you do make it here for Cubs spring training you will still get tons of exclusive Cubs stuff you won’t find anywhere else on the net. “Tons of exclusive Cubs stuff”, that’s my kind of journalism. As a youngster growing up in Long Beach, CA I distintly remember the Cubs spring training in my home city in 1966. That would have been my last year at Jefferson JHS before attedning Wilson HS in the fall. I recall attending a couple of the games at Blair Field – one may have been Cubs vs. the Angels. Also, I remember the then McDonald’s on East Anahem St. had a promo one day and I got autographs of both Ernie Banks and Chris Krug.